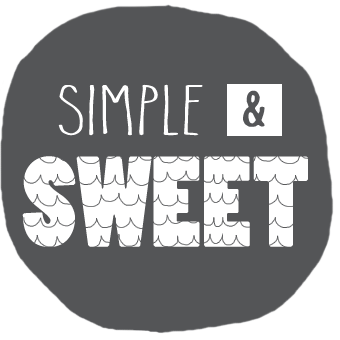 Simple & Sweet: Oh, what a stash! Almost exactly 2 years ago I sewed my first quilt and promptly threw almost all of the remaining scraps of fabric away. It's taken this long for me to regret that decision, and now I'm totally kicking myself. At the time, that quilt began as at project to check off of my bucket list, and I was more testing the waters to see if sewing was something I'd ever want to take up again than anything. It didn't take long before I started pinning ideas for projects and purchased my own machine, but without a dedicated space for sewing, completed projects were few and far between and pretty simplistic. It wasn't until this past winter when Modern Textiles opened their doors that I really became enthusiastic about sewing, and not really until this summer before I began making a point to make time for it. I've limited myself to mainly purchasing fabric for specific purposes or projects to keep my stash of fabric pretty refined and limited, and since I typically use most of what I purchase I have a very limited supply of scraps. 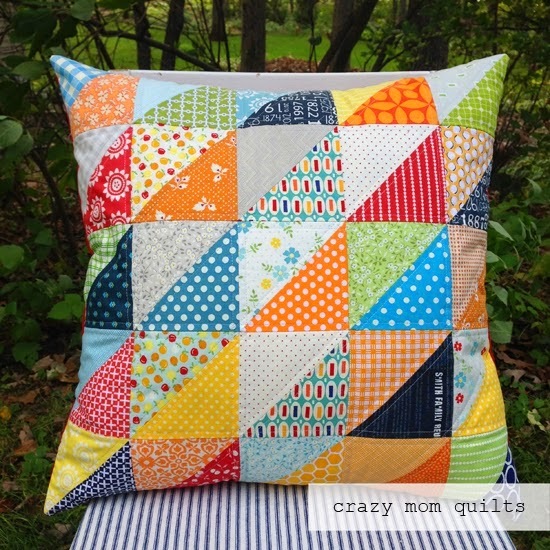 Up until this weekend I considered that smart sewing, until I met Amanda Jean Nyberg of Crazy Mom Quilts and my jaw dropped when I saw her scrap quilts and pillows. Wow, I wish I had her eye for fabric. Her style of mixing vibrant colors and a huge variety of fabrics creates the most beautiful effect. Clearly I need to become braver and step out of my comfort zone, and clearly I need to not be afraid to collect a variety of fabrics that I love, even if I don't have a specific project in mind at the time. And now, of course, I'm wishing that I hadn't thrown away those original remnants of the fabrics I used for Josiah's quilt, since they would have been PERFECT in this pillow for his bed! 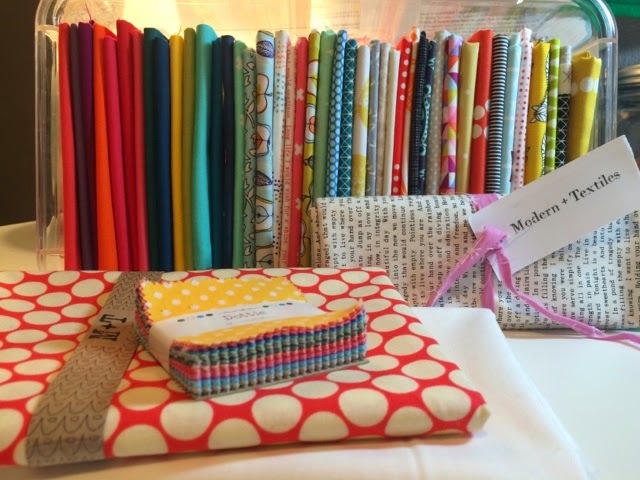 I picked up "a few" fat quarters in both prints and solids to begin a collection of pieces to work with. 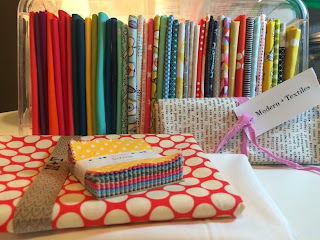 The charm pack (bundle of tiny squares) will be my first project inspired by Amanda. Pillow tutorial on her blog here... Going to be going WAY out of my comfort zone on this one...putting together little pieces and lining everything up accurately, doing my own machine quilting, first envelope pillow assembly (red polka dot under the charm pack will be the backside of the pillow, envelope tutorial here...), and first attempt at making my own pillow form (her tutorial for that here...)...I just LOVED the weight and feel of the forms she made herself. Soft enough for napping on the couch, but much denser and heftier than the wimpy pre made ones. I'm sure no pillow fights would happen with these. 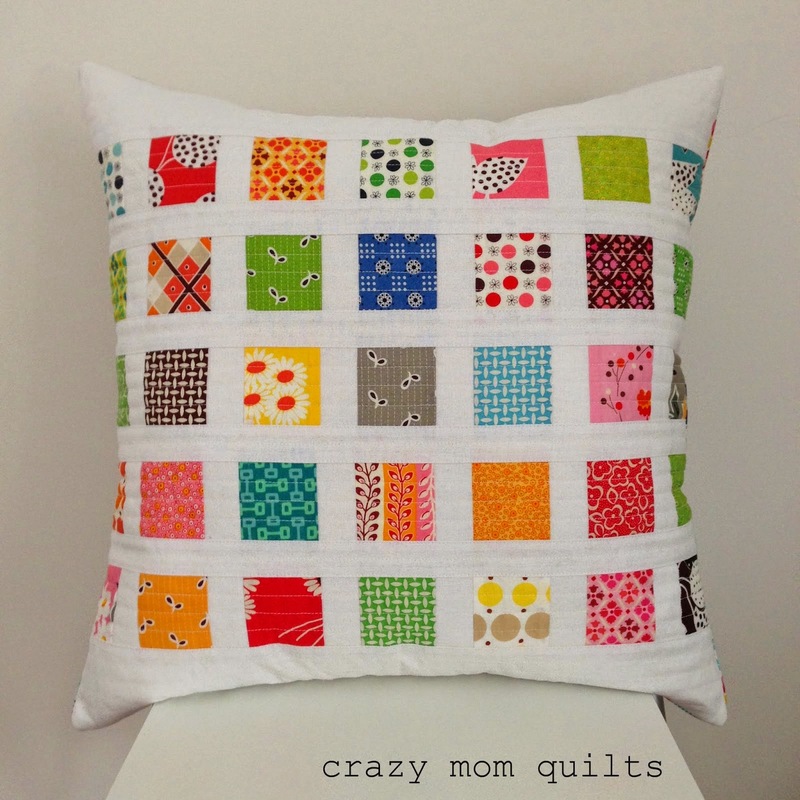 I am totally inspired to try quilting a few pillows to test the waters. Jim will "love" that! Piles of pillows are his absolute favorite. Lol! I just added 5 throw pillows to our bedroom on top of the 6 bed pillows. What's a few more, right? The living room and Josiah's bed clearly need a few. Happy stashing and sewing y'all! 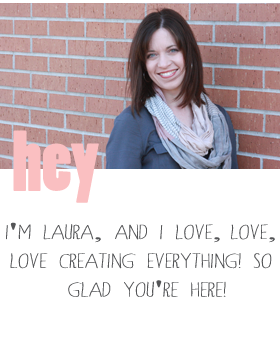 Note: Credit for pillow pictures goes to Amanda and her blog. I snapped a few on my iPhone this weekend, but they just didn't do them justice.